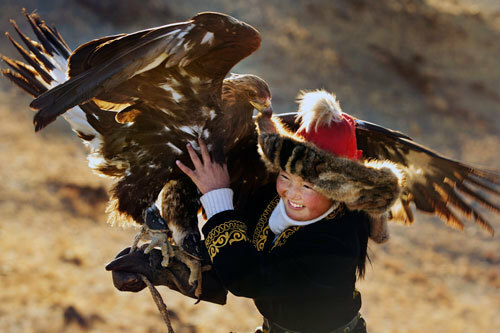 NOTE: Look for The Eagle Huntress to open in December in many areas!!! 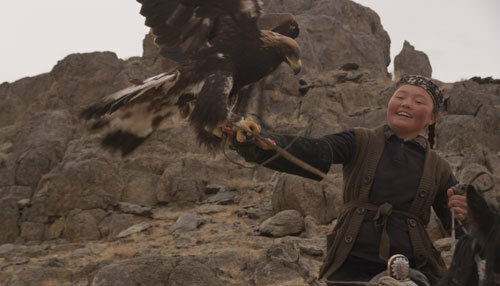 We can compare The Eagle Huntress’s lead, true-life character Aisholpan easily with Rey in the new Star Wars films. The 13-year-old girl is brave, strong and a powerful young woman in a universe in which men have controlled much of the power. 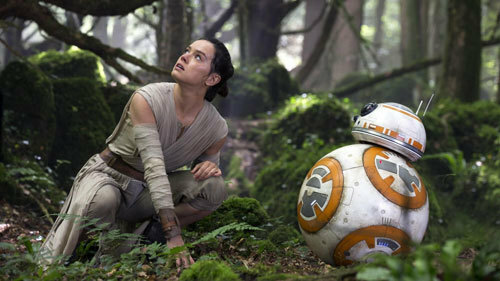 Daisy Ridley narrates and co-executive produces this film that she truly believes in. 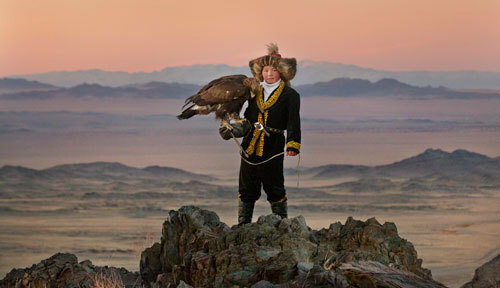 The Mongolian mountain people have caught, trained, loved and used huge golden eagles to hunt prey for food and fur to keep families warm in the massively cold temperatures of their brutal winters for centuries. 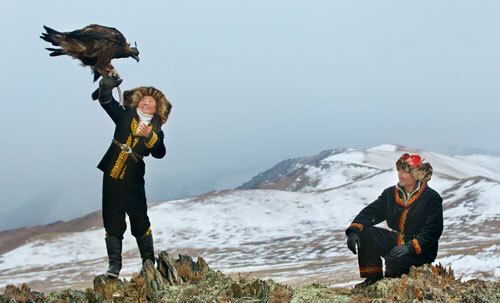 Young Aisholpan is determined to be one of her nomadic people’s very first female Eagle Hunters. Her mom and dad are totally behind her obsession despite the fact that there is massive opposition to her gender-flipping desires. 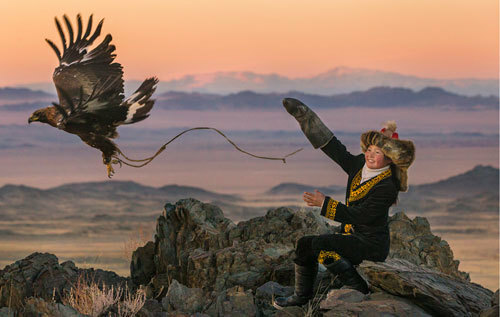 Documentary filmmaker Otto Bell saw an amazing still picture of Aisholpan dressed in beautiful, traditional clothing holding a huge 15-pound golden eagle and he was stunned. 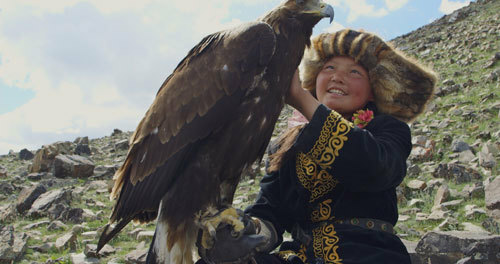 He had to find this girl and make a film about her and her eagle. 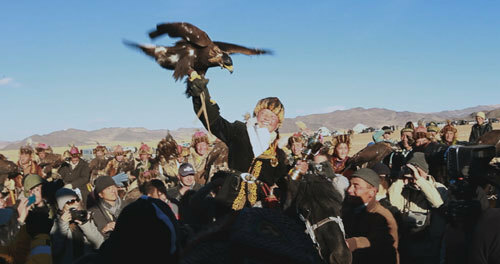 Aisholpan was breaking tradition entering the world of eagle hunting. Who best to narrate her story? Daisy Ridley whose character Rey reflects Aisholpan’s courage and determination. Check it out! Kidzworld: Daisy, when you were Aisholpan’s age (13), were you also living your dream by studying music and acting? 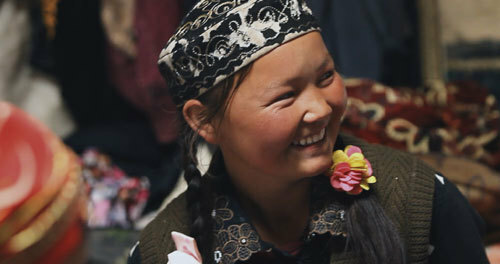 As a tween and teen, do you think you felt as strongly about that craft as she does about being an Eagle Huntress? Daisy: I was at performing arts school but I wasn’t there because I wanted to go. There were a variety of reasons that took me there. I think when I was 13, I was injured so I wasn’t able to perform in any productions at school. I didn’t build the same kind of passion for it as Aisholpan does at that age. It’s been a growing thing. I didn’t have the poise or work ethic then for it. Kidzworld: So many tweens and teens are socially shy. Aisholpan is brave but seems a bit shy. Daisy, were you shy at that age? If so, how did you manage to break out of that to pursue your career? Daisy: I (don’t think I was) shy at 13. I’ve always been very talkative (she laughs) but (on second thought), I think maybe I was shy and I talked to get over it. My shyness has gotten worse in the last few years I think (with all the fame her Rey character has brought her). I don’t really know Aisholpan. Otto knows her well. I don’t know that I’d say she is shy. It’s just that, in that culture people address each other differently and act differently. The way people talk and move even is different. I would look at her and say she is more measured. When she does say something, she’s thought about if it’s worth saying. Kidzworld: And you don’t really do that? Daisy: Well, I’m for sure someone who talks so much about things that don’t really need to be said (she laughs). In that respect we’re really different but I think we could all learn a lot from that, being more quiet because it takes nothing away from her. She’s still incredibly determined. She still does what she wants to do but she’s not overly celebratory of it. It’s just what it is and the family has always been supportive regardless of whether she wins the tournament or not. I think it’s amazing to see a 13-year-old with that much quietness. Kidzworld: She is so cool. Otto, did you see comparisons to Daisy’s “Star Wars” character Rey in Aisholpan? Otto: Well Daisy and I first spoke about the film the night before the Sundance (film festival) and I don’t think we talked once about Rey. What we talked about was Daisy growing up, her life had always been supported by a very supportive family and she has always been encouraged to fulfill her ambition and to strive for what she believed in and was determined to accomplish (so was the film’s real-life star Aisholpan). That, for me, rang truer than any kind of parallel with fictional character Rey. That said, I don’t think either of us is blind to the fact that the character of Rey touched a lot of boys and girls out there and I think it is lovely that Daisy was able to lend her voice to this film and hopefully bring some of the excitement and passion that Rey engendered and carry that over to the real world and this little girl’s true story. Kidzworld: Otto, there were so many challenges for you while shooting this beautiful film. What would you say was the biggest challenge? Otto: Every part of it was hard. It was a constant fight. I spent all my life savings on it and I’d never been in debt before and that was very nerve-wracking. The hardest part of it was filming in the winter. It would be minus 50 degrees. We had put aside five days to film that winter sequence but everything broke and nothing worked and it ended up taking us 22 days. I was trying to get the best product possible but then you’ve got this specter of money hanging over you. It tends to inform what you’re doing. 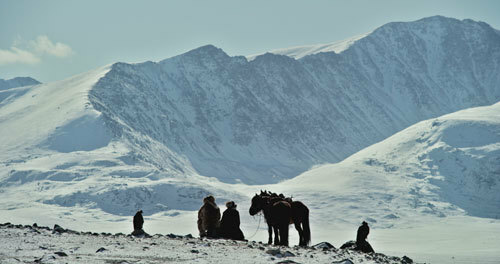 But filming in minus 50 degrees was probably the biggest challenge. We would see Aisholpan and her father just plowing through the snow so we really weren’t in a position to complain about it. These two are getting on with it so you have to take your lead from them. She was an inspiration. Kidzworld: Daisy, what most surprised you about Aisholpan’s way of life? 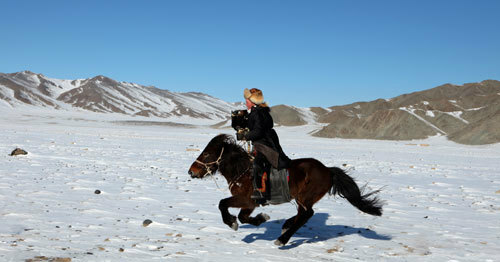 Did you know anything about the Mongolian mountain people? Daisy: I did go to Scandinavia last year and we went to an exhibition on the Sami people. 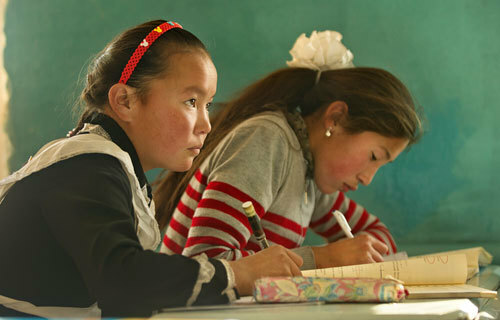 They are nomads (like Aisholpan’s people). I read a lot and try to keep up with what’s going on in the world but to see Aisholpan’s family life, the day to day and the family interaction in the film is really warming and even though the eagle thing is so big with Aisholpan, we are watching the life of this family. That was gorgeous. Kidzworld: Do you have any nieces or nephews or kids in your life that you are taking to see the film? Daisy: I don’t have any nieces or nephews yet but I have extended family nephews. I think it comes out in England this month and some of my family went to see it at the London Film Festival. My mom is coming to New York to watch it which is very exciting and I’m talking to everyone about it and encouraging everyone to go. For parents to see the film is gorgeous and to be a part of that experience with their kids even better. Kidzworld: Otto, how did you get Sia to perform the song that is over the end credits? It’s got a great message “You Can Do anything”. Otto: It was Morgan Spurlock (revolutionary documentary filmmaker) who did that. I’ve been lucky to get a kind of shield wall of producers and executive producers around this project as its rolled on. Morgan came on board quite early. We had our fair share of arguments but in a constructive way. He wanted a poppy soundtrack and he asked who I wanted and I said “Sia”. I said it as a throwaway and he went and got her. Daisy: Oh my God, I love her! 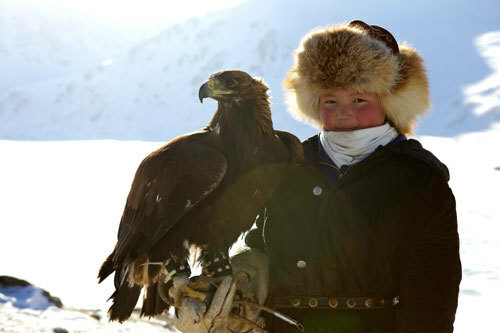 Kidzworld: What do you both hope that young people everywhere can take away from seeing The Eagle Huntress? Daisy: For me, it made me think “Oh my God, I would love to visit there and see amazing people in these places and communities I’ve never met before who live life such a different way and get so much joy and love from that”. It was (getting) that sense of coming home and being surrounded by people you love and how important that is and also to not think you have any limits. When we see her taking part in the (eagle hunter) competition, of course everyone wants her to win but even if she doesn’t, that’s not the point. The point is that she is doing this thing she wanted to do and regardless of whether she won or not, people’s minds are changing. She’s proving that things can change and you don’t have to be this one thing (in life) that her culture tells her in order to do what you want to do. Kidzworld: That is a great message. Otto: That’s exactly right. The reason why I didn’t end the film with Aisholpan holding her trophy up was because that was a public victory. It wasn’t what was important o Aisholpan. She successfully hunted with a bird she had trained. That’s what she accomplished. People can take away that if you are determined and work hard you can accomplish anything even though it’s in a very distant place and in a culture about which we know little, I hope people are inspired by that. 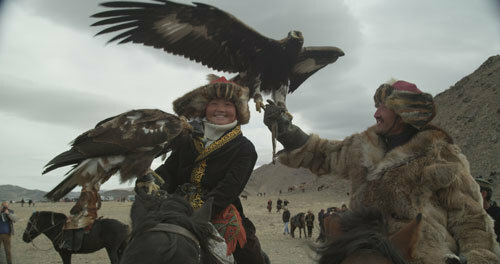 There were three new women eagle hunters at this year’s festival so it is happening! Kidzworld: That is so great! What’s next for both of you? Daisy: I’ve got Murder on the Orient Express coming out next year (and of course “Star Wars” continues). Otto: I’m not sure yet. Let’s see how this one does. 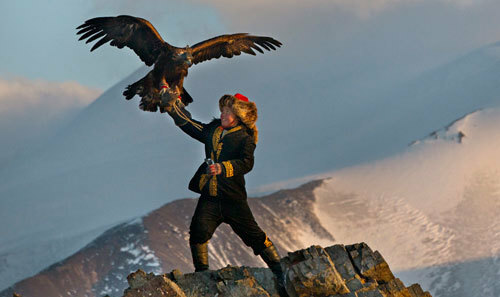 You can see The Eagle Huntress in theaters Wednesday, November 2nd! Whether you are a boy or a girl, do you think girls should be able to do things that boys ordinarily do if they want to? Do you love working with animals? Let us know below. What Type of Aircraft Would You Like to Fly?